Check our Facebook page for updated upcoming events. Late April— Futbol Es Vida — In collaboration with Pitzer’s Community Engagement Center, we host an annual *Fútbol es Vida* Soccer Tournament Fundraiser for a day of solidarity, food, fun, music and more! May 1st — International Workers Day — On this day, we celebrate the contributions of immigrant workers and the urgent need for legalization. We typically close the Center on May 1st so that everyone can participate in the local marches and actions. We have participated in the Los Angeles march, but for the last two years we have joined with our allies in the Inland Empire to support their march. May 5th — Fernando Pedraza Memorial Celebration — This event is held in the morning on the corner of Arrow and Grove to honor the life and leadership of Fernando Pedraza who was killed on the corner on May 5th, 2007. The Pedraza Coalition, Rancho day laborers, student volunteers, and PEOC staff organize this event, which includes arranging the food, the musical performances, community outreach, and the program. Many students attend, as well as day laborers from Pomona and Los Angeles. September 16th — Latin American Independence Day – The Center hosts an annual celebration at the Day Labor Center to honor cultural diversity. 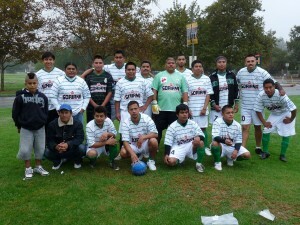 October or November — The Southern California Day Laborer Soccer Tournament (Torneo Jornalero) – The tournament is held at the Rose Bowl in Pasadena once a year. For the last two years, Rancho and Pomona have placed and last year Rancho received first place. We bring teams from Pomona, Rancho Cucamonga, San Bernardino, and Riverside. Students are welcome and encouraged to help organize the teams, practice with the teams, play on tournament day, and support the team in general. This is a very important event for the workers. Thanksgiving — Thanksgiving Meal —The Pomona Day Labor Center hosts a Thanksgiving meal at the Center on Thanksgiving Day from 10 am to 2pm. We generally have about 150 people attend the event. We also hold a raffle to give away donated turkeys to the workers and their families. We also raffle out other donations (typically food and clothing) to the workers and the attendees. We invite the whole community and students are also welcome to come. 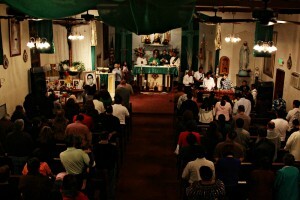 Late November — Day Laborer Mass —The Pedraza Coalition coordinates this event at Our Lady of Mt. Carmel Church to honor the work of day laborers and immigrant workers during the Thanksgiving season. Students have helped organize the event and many have attended the Mass and the celebration/potluck afterwards. The Jovenes Sin Fronteras youth group has also helped plan this event in the past. December 12th — Día de Guadalupe — Throughout the year, the Pomona day laborers donate funds to host a Mass and celebration of the Virgen Guadalupe. The workers decorate the Center and arrive at dawn to begin singing traditional songs to honor her special day. We typically have champurrado, pan dulce, and tamales for the workers to enjoy. Other workers bring flowers, menudo, and other things to share. We invite a local priest to give a small service at the Center. It is one of our favorite events and a very special time for the workers. Early December — Posada —We have been increasingly doing annual Posadas in Pomona and Rancho Cucamonga. In 2009, the Pomona day laborers and students from Pomona High School organized a Community Posada in downtown Pomona where we asked for shelter and an open door for immigrants (this is an alternative type of Posada that is pro-immigrant and reminds us of the importance of welcoming and helping “strangers”). It was a very successful event and more than 150 Pomona students and their families participated, along with over 20 day laborers. We hope to continue this tradition. The Rancho Cucamonga day laborers have held 2 Posadas in the past around the day laborer corner with assistance from leadership and the youth at Mt. Carmel Church, along with friendly neighbors and the Pedraza Coalition. December 24th — Christmas Celebration — Every year, the Center hosts a Christmas celebration at the Center on December 24th from 10 am to 2pm. We have a Toy Drive for the day laborers’ families and children in the community, sponsored by the Latino Chamber of Commerce and city councilpersons. We share a big meal and raffle out other gifts for the adults as well (like tools, clothes, gift cards, etc.). This event is open to the general community and we invite all our friends and allies. We also look for donations for the raffles (especially warm clothing and blankets) to help the workers through the harsh winter season.